September 30, 2017 By This post may contain affiliate links. If you’ve wanted to make chocolate pumpkin bowls for Halloween but don’t want to use a balloon to do so, you’ll want to check out this tutorial. 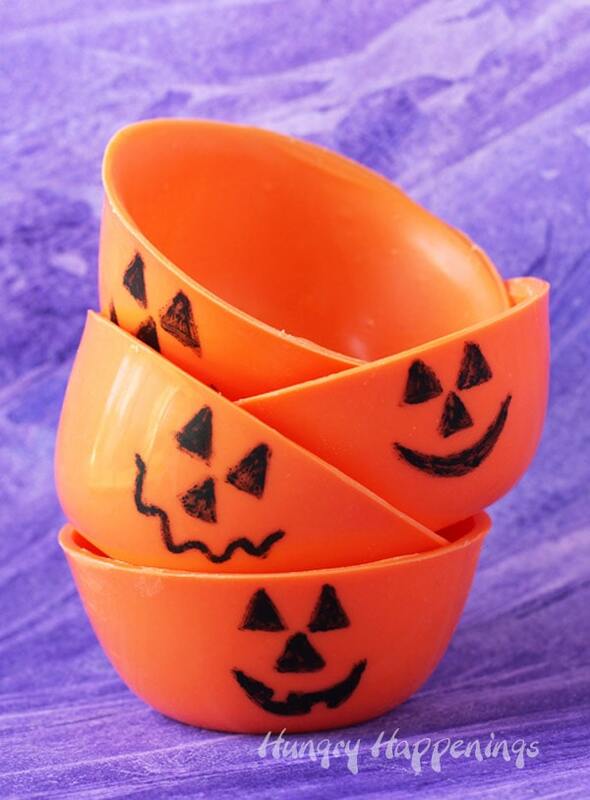 I’ll show you how to make Chocolate Jack-O-Lantern Bowls using a plastic bowl as a mold. Then you can fill the edible bowls with homemade orange ice cream or candy. It is so fun making chocolate bowls or cups and I was excited to create these Chocolate Jack-O-Lantern Bowls for Halloween using an easy technique. Last year I showed you how to make Chocolate Jack Skellington Bowls using a balloon. You dip the balloon in white chocolate, allow the candy to harden, then pop and remove the balloon. This technique makes really wonderfully shaped chocolate bowls but many of you have expressed concerns about latex allergies so I’ve come up with a few other ways to make homemade chocolate bowls. I’ve already shown you how to use a half sphere silicone mold to make Chocolate Sprinkle Bowls, silicone shot glass molds to make Chocolate Heart Cups, Zombie Candy Cups, and Frankenstein Candy Cups, as well as, plastic cups to make Chocolate Turkey Cups. For this project I still wanted a bowl shape, as opposed to a cup shape, but I wanted something taller than the bowl that was created using the silicone mold. It’s a challenge finding a mold that makes a taller chocolate bowl, but when I spotted some nicely shaped plastic bowls at the dollar store I knew they would be perfect. When you are looking for plastic bowls to make these chocolate pumpkins be sure to find some that curve out slightly at the top edge. That will make the chocolate much easier to remove. You want a smooth inner surface. Do not use glass bowls. The chocolate will not release from the glass. Also don’t use bowls that curve inwards. You won’t be able to remove the chocolate if the top edge curves inwards. To make these jack-o-lanterns you can use orange colored, pure white chocolate that is melted and tempered or you can use orange confectionery coating (Candy Melts) like I did in the video tutorial below. Check out my Chocolate Making Tips page for more information about the differences between the two types of candy. You can fill these cute chocolate Halloween bowls with candy, nuts or something creamy like pumpkin cheesecake mousse or homemade orange ice cream. I’ve shared the recipe for no-churn orange ice cream below. I thought it was the perfect treat to go into my Chocolate Jack-O-Lantern bowls. You can find items needed to make these chocolate pumpkin bowls from amazon (commission earned for sales). I found some plastic bowls on Amazon that would make perfect jack-o-lantern bowls. The have vertical grooves in them which would give your pumpkins a more realistic shape. I wish I would have seen them before I made my bowls. I’ve added the image link below. I found my bowls at my local dollar store. 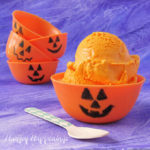 Orange colored white chocolate bowls decorated to look like Jack-O-Lanterns for Halloween are filled with no-churn orange ice cream. Fill a small plastic bowl with orange chocolate. Turn the bowl upside down and allow some of the chocolate to drip out. You want just enough candy coating the sides of the bowl to form a nice shell (about 1/8th inch thick). Scrape the dripping chocolate off the edge of the bowl then invert the bowl and place it in the freezer for 5 minutes. Repeat, making a total of 6 bowls. Let sit at room temperature for at least 10 minutes. 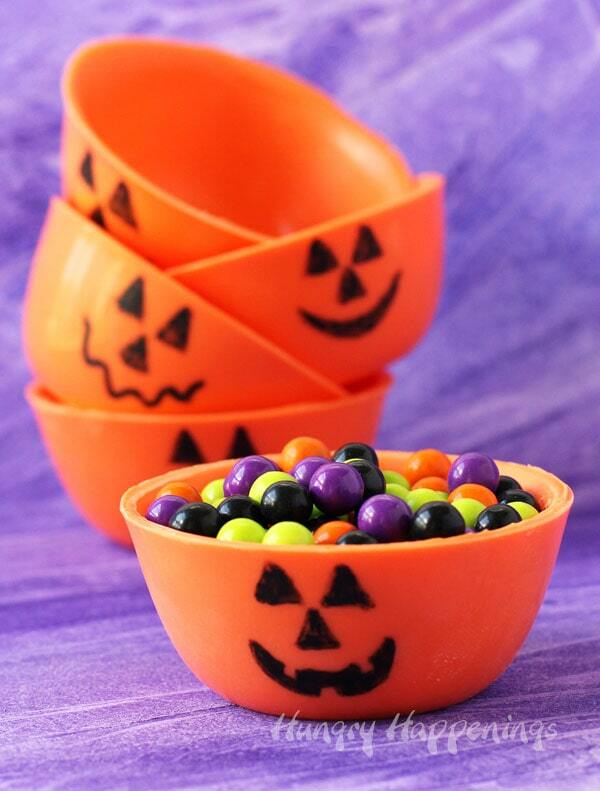 Draw jack-o-lantern faces on the bowls using a food coloring marker. Beat heaving whipping cream until it holds stiff peaks. Add sweetened condensed milk, orange oil, and orange food coloring. Pour into a plastic tub and freeze for at least 4 hours. Scoop ice cream into chocolate jack-o-lantern bowls just before serving. Optional: add a chocolate fudge roll stem if desired. 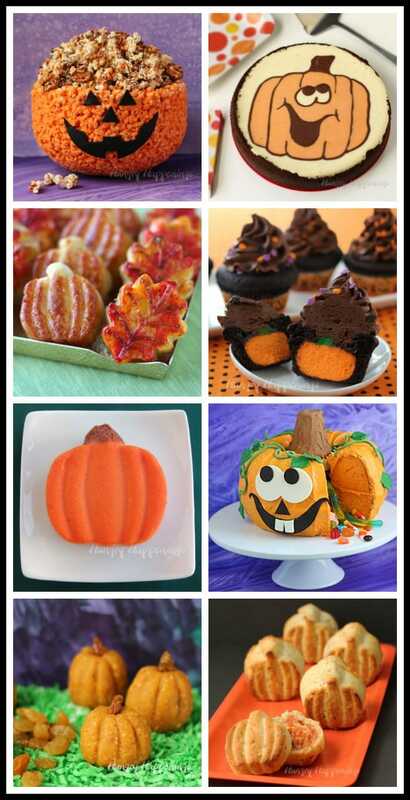 While you are here you might also want to check out these other pumpkin themed treats. If you make these Chocolate Jack-O-Lantern Bowls and share them online be sure to mention Hungry Happenings and link back to this post. Use the hashtag #HungryHappenings on social media and if you’d like your picture shared in my Readers’ Gallery, be sure to send a picture to beth@hungryhappenings.com. Not familiar with “orange oil”. Where do you find this? PLEASE ADVISE. Thanks in advance. I usually use LoRann Orange Oil. You can find it from Amazon (using this affiliate link) – https://amzn.to/2GEGmXQ. I can also find it at my grocery store. Some stores stock it in the baking aisle while others have it in or near the pharmacy. The oil comes in tiny little DRAM size bottles. One bottle is enough to make a batch of ice cream. You can also use orange extract. Just add a teaspoon then add more until you get a nice oranges and cream taste. I totally agree. This method is super easy to make and you don’t have to worry about latex allergy issues. Thanks so much. I am so glad you like my videos!